My second entry for the Blogger's Quilt Festival is this queen sized Penny Patch quilt I completed earlier this year. It measures 90" x 108." I've really challenged myself recently with trying new techniques: intense paper piecing, curves, precise piecing for a 100 block sampler, etc. Doing all those new things has been a lot of fun, but at the end of the day, I really love basic patchwork. This quilt works for me because I really appreciate the colors, the use of black, and the simplicity. I am glad I made it so big, as I've enjoyed using it on my bed frequently. 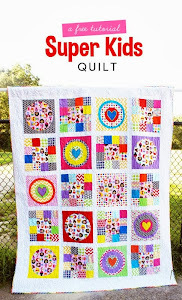 Linking up Amy's Creative Side for the Large Quilt Category in the Blogger's Quilt Festival. Before all of the Halloween craziness and fun begins, I wanted to enter the Blogger's Quilt Festival. For me, 2014 has been the "year of the pillow." I've made quite a few for gifts, a giveaway, and several for my own family to enjoy. This pillow is 24" square and the hexagons are English paper pieced and appliqued to the front. I chose lots of bright colored fabrics from my stash to compose the flowers. The pillow is made of one of my favorite black and white prints from Summersville. First of all, thanks to everyone for all the love I received on Friday's post! I've been waiting a while to splurge on the Forest Abstractions pattern. I'm not interested in making the whole quilt but I knew I wanted to have that huge stag in my DYO Sampler quilt. I finally bought it when Pink Castle Fabrics issued a code for 30% off everything in their store. I needed a big cut of Kona for the background and the only thing I had on hand that would work was this 2 yard piece of Kona Turquoise I had stashed with the intention of making another Giant Star quilt. I would've liked to use something lighter so that I could justify using more brights to create the deer- but I am happy with how the head has come out. It's such a weird color combo: dark brown, grey, gold, yellow, and green- but I like it. I also have to say that I love having a light box to help me with paper piecing- it's something I never would've splurged on at the store- which makes it the most epic $10 yard sale find ever!!!!! I won't be updating progress on this Jacob's Ladder quilt too much but wanted to share that I am steadily hand quilting it with some gorgeous DMC variegated perle cotton. It's relaxing to do in front of the TV and feels quicker than cross stitch. I would love to have it all completed by the end of the year. So I am finally on Instagram with the username dresdenlane. I still intend to blog regularly here- I enjoy all of the elements of blogging too much to walk away. I am not exactly sure how I am going to interact on IG- it'll be a bit of a process to work that out. If you are active on IG- please comment with or email me your username so that I can follow you. Sorry if my regular readers are sick of seeing me make this dress (#7) but the Rollerskate dress is just too cute, easy, and perfect for fun/modern fabrics. I also used another fun novelty fabric and other stash favorites to make a Sew-Together bag for a friend. I wish I had the stamina to make these for all of my friends who sew- it's just the perfect bag for all your little tools and notions! I still need to make one for myself but it will happen eventually. I am going to finally start ordering my zippers on etsy (zipit?) and stop paying the high prices at Joann's. So what about you- do you like using novelty fabrics? Are they hard to resist or do you stick to basics/blenders and more "grown up" fabrics? 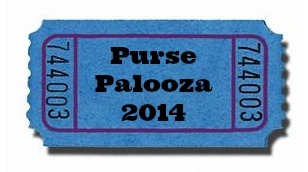 Linking up to Finish it up Friday at Crazy Mom Quilts and Purse Palooza at Sew Sweetness. On Monday, I found myself with a little extra sewing time thanks to the federal holiday. I finished another Union Jack block but decided to treat myself to something different. I finally settled on adding another block to my DYO Sampler quilt I started over the summer. I pulled out the pattern, Lots of Dots, and tackled a block. This is my result and I am pretty happy with it. I've done curves in bags and toys but never for a quilt. I like the result a lot. This block took a lot of time because you have to cut out every piece with scissors and a template. The process of making the sampler quilt is pretty awesome: I can try out different blocks easily and decide if I want to commit to a larger project. I was amazed to be able to complete my Red Letter Day Halloween quilt in time for the Halloween/fall season. I really rushed to get this done because I had the opportunity to rent a longarm a few weekends ago. I used combinations of Halloween novelty prints from my stash as well as blenders. It was really tempting to use just Halloween prints- if only to use them up- but I decided the combination of normal quilting cottons were fun to use among the quirky pumpkins, ghosts, and cats. 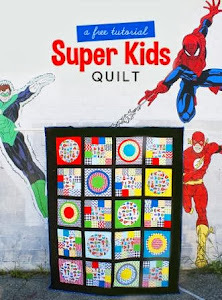 Sadly, the intended recipient of this quilt (my 5 year old son) has completely rejected this quilt and refuses to use it- he's being very vague about it but I think it's the spiders that bother him. My husband also had to point out that the spiders should have eight legs. Did you notice? I sound negative about this quilt- but I am really fine with it- it's not my most favorite thing I've ever made but like it and I had fun making it. I still have a boatload of Halloween fabrics- so maybe I will take another shot at making another Halloween quilt again someday. Shortly after writing Monday's post about being in a "sewing funk," I went ahead and forced myself to sew- sometimes when you don't feel like doing something- you should just do it and eventually your mood will change. I splurged on a copy of the magazine Love of Patchwork and Quilting a while ago because I loved the cover quilt as well as the large paper pieced Union Jack pattern the issue had. I thought it would fun to break up some of my bundles and pair bright and colorful large scale prints with complementary blenders from my stash. Here's my start so far: and AMH Pretty Potent floral with a Hat Box print- these two fabrics were meant to be together. My next combination was a JD Bungalow print with a Heather Bailey True Colors blender. I have to admit that I am a bit in a crafty funk lately- I am not sure what to start next and lately I've favored watching Disney movies with my son over starting anything new.... I really rushed through my last few finishes and it was stressful- I think I burnt myself out. I've also fallen into the bad habit of browsing online fabric stores and filling up shopping carts- without finalizing anything- but surely wasting my precious sewing time. What do you do when you can't decide what to start next? Am I the only one who can focus too much on the very fun part of acquiring more materials instead of diving in with what I already have? I'd love to hear your thoughts- it isn't often that I don't just dive into the next project with happiness and enthusiasm.